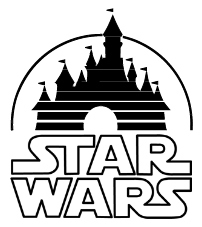 Disney certainly aren't shy about playing with the Star Wars brand either; their first announcement upon the acquisition to that a new movie, Episode VII, will be coming to screens as soon as 2015, with more to follow - In fact TheForce.net report plans for films every two to three years! Plus even more new Star Wars TV series. George Lucas will continue his association with Star Wars as a creative consultant. You can read the full press release about Disney's purchase, here. I am cautiously optimistic about this. Since The Clone Wars relaunched Star Wars on TV, and with more TV plans already in the works, it's been interesting in recent years to start to see Star Wars as an expanding multi-media brand, and not just a film series with some particularly successful tie-in products. Disney have done a pretty good job working with/owning Pixar and Marvel, so perhaps they can be trusted with another distinct production entity under their wing. At the same time I look to Disney's in-house stuff and worry a little - In particular I'm thinking of John Carter, which was an absolutely brilliant, stunning, and all round amazing film, which I think could easily have been the next Star Wars itself. Except Disney made a mess with the marketing and the film flopped! A new Star Wars film every two years also seems a bit excessive. But I guess it depends how they treat it. Star Wars 7, 8, 9, etc could become tiresome. But if they were to pursue a strategy similar to the Marvel films, and have a myriad of distinct film series within the single Star Wars universe, I think that could get interesting. One can't help but wonder what the future may hold for Indiana Jones too... So I guess for now, let's hope the force is strong with Disney.